Here we list a few recent news items about our students and alumni that have come to our attention. See individual posts for details about their current work and accomplishments. Professors Glenda Drew and Jiayi Young, and design undergraduate student Michelle Lee and 2016 graduate Darin E. Reyes have recently received the Crocker Art Museum ArtSpots commission totaling $31,800 to create two artwork installations specifically for children five and under in the museum’s public spaces. The project is a part of a larger project being funded by the Institute of Museum and Library Services (IMLS). The estimated opening date for the installations is October 2017. Professors Glenda Drew and Jiayi Young, with undergraduate students Michelle Lee and Darin Reyes, presented a guest lecture, “Design for Social Change”, at Hong Kong Polytechnic University. Simon Sadler will be presenting as a keynote speaker at the symposium, Aquarius Redux: Rethinking Architecture’s Counterculture, at the University of Sydney. On April 30, 2016, the Design Department brought together UC Davis designers of all fields, passions, and classes to host the 2nd Annual Alumni Networking Day. Formerly called the Alumni & Portfolio Day, the Alumni Networking Day reached nearly 100 participants, including POP UP shop vendors, alumni speakers and panelists, volunteers, and alumni and students of all majors and grades. Professors Glenda Drew and Jiayi Young will present a guest lecture at The Hong Kong Polytechnic University with undergraduate students, Michelle Lee and Darin Reyes. The group will give a public talk, tour the multitude of design labs and meet with the dean, Cees de Bont (who is also the co-Director of ISEA 2016, a conference the four are presenting at in Hong Kong). On February 20, 2016 and March 5, 2016, the Design Department launched its first-ever two-part series for POP UP Workshops, professional development workshops led by Design Department alumni. The A’ Design Award and Competition has announced that Helen S. Koo, assistant professor of design, Jason Lin, design student, and Jasmine Zhou, electrical and computer engineering student, have won A’Awards for Enfold: Smart Transformation Transformable fabric. Their creation was developed in the Fashion Design and Technology Lab (FT Lab). For more about about the concept behind Enfold fabric. At the National Conference for Undergraduate Research (NCUR) in Asheville, North Carolina, Jason Lin presented his Honors Thesis Project on disabilities and illness and its inclusion in children’s books. At the National Conference for Undergraduate Research (NCUR) in Asheville, North Carolina, Darin Reyes presented his Honors Thesis Project on student’s emotional health and creative expression. On April 7-9, 4th-year Tim Stapleton represented UC Davis Design at the 30th annual National Conference on Undergraduate Research (NCUR) in Asheville, North Carolina. His research is on visibility aid design for biking at night using 3D eye-tracking technology, under UC Davis Design professor Helen Koo. Tim presented his research (while wearing his eye-tracking glasses, as seen in the picture) to numerous other researchers from all disciplines at the conference and hopes to submit his research paper to a journal this quarter. On April 23, 2015, graduating design students had the opportunity to visit two well-respected design companies in San Francisco. The first stop was SY Partners, a consulting firm that works with CEOs of other companies to set “vision and strategy.” Students were welcomed with a presentation of a current project at SY Partners by Managing Creative Director Thomas Winkelmann and UC Davis design alumna Liz Sutton. UC Davis Design student Marissa Meier won the poster design competition this year for the UC Davis Farmers Market. 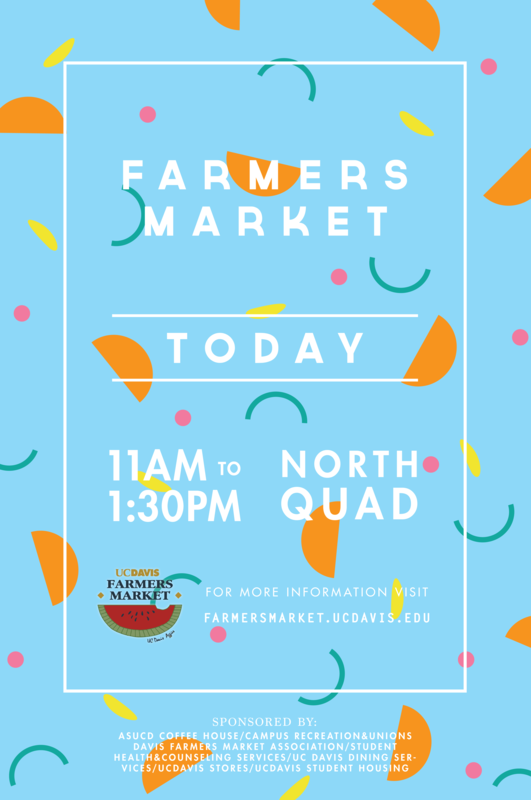 Her fun, bright poster was chosen to notify people of the on-campus farmers market that’s happening on the North Quad on Wednesdays of spring quarter. Although you may see an altered version of Marissa’s work on the day of the farmers market, her original design is displayed here online. Anel Zarate, Design ‘15, received the 2014 SDA Creative Promise Award. The Creative Promise Award for Student Excellence is given once a year by the Surface Design Association to recognize excellence in a body of work by two outstanding students, one undergraduate and one graduate. Each student is awarded $750, which may be applied to tuition, materials, equipment, educational travel, or any other expenses related to professional development. In addition, the winner’s work is featured in an issue of the Surface Design Journal. Leah Huntsinger, Design ’04, visited the White House on October 8th, 2014 with her employer, Christy Rilling Studio, a high profile tailoring and custom design Atelier/Agency. As part of her job, Leah works with celebrities, fashion magazines and production companies, fitting and tailoring clothes for events, advertisements and editorials. According to Leah, “we work with Vogue a lot, and I’ve done shoots with Glamour and WSJ magazine. I travelled in July with Tonne Goodman, of Vogue, to shoot October’s cover and photo spread of Reese Witherspoon in Nashville.